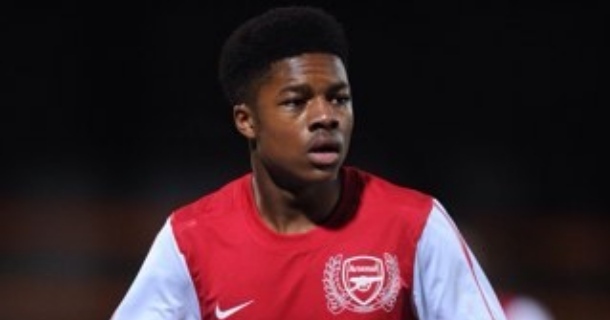 Chuba Akpom scored Arsenal’s opener but it wasn’t enough for Arsenal to evade defeat. Chelsea went one step closer to setting up an FA Youth Cup final derby clash with Fulham after they beat Arsenal 2-1 at Stamford Bridge last night. Chuba Akpom gave the Gunners a second-half lead but goals from Charlie Colkett and Alex Kiwomya gave Chelsea a narrow first leg victory. Isaiah Brown and Dom Solanke were back in Ade Viveash’s line-up fresh from their appearances for England Under 17s and helping the national side qualify for the European Under 17 Championship. After a goalless first half it was Arsenal that struck first. Ainsley Maitland-Niles set through Akpom, who expertly dodged past Ola Aina and dispatched a neat finish past Mitchell Beeney. Ruben Loftus-Cheek set up Colkett to grab the equaliser just three minutes later with a counter-attack that the 17-year-old lashed home. Solanke’s header was directed straight at the goalkeeper but an acrobatic finish by Kiwomya saw the rebound fly in the net and give Chelsea the win on the night. The second leg takes place on 17th April at the Emirates and is live on ITV4. Viveash told Chelseafc.com: “It was a big physical exertion and we’ve just shaded it tonight but there’s a long way to go and we know it’s only half time in the tie. We’ve seen tonight what it’s going to take to overcome this Arsenal team. “I never doubted our ability to come back in the game. We did it at Newcastle in the last round and that’s what happens when you get a positive result away from home coming from behind. Now that we’ve done it twice that will only build the belief in the group.